EVP Office includes "enterprise" features for centralized management of EstateVal, CostBasis and CapWatch across an entire company. To activate this feature you need to open evpadmin.exe located in the installation folder. Imagine you have ten users in two workgroups. They all share the same network, but some run Windows 95 and a few Windows NT. 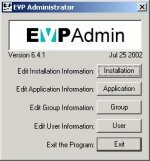 You want to install EVP Office once, to simplify and control updates. Company-wide policy is that all users print and save invoices for each portfolio valued. The two groups differ on their access to network printers, and in fact disagree on the preferred report format for valuations. As you would expect, there is no consistency in modems, neither in speed nor brand name. Installation & Application Settings are the base settings of preferences for all users of a particular installation of EVP Office. Group Membership & Settings are a convenient way to set requirements and preferences for groups of users. User Privileges & Settings allow access and specific preferences to be set for individual users. First, let's set the installation-specific information. This data is relevant to the entire installation of EstateVal or CostBasis, and is the base from which Group and User information is derived. To move to the Installation Information screen (Figure 2), click on the Installation button. Set the Installation Name to what you would like to call this particular installation of the program. (Any text is acceptable. A good entry should describe where the program is kept, such as "Main EstateVal Installation" or "Los Angeles Branch"). Set the Administrator Name to your name, so that people who have trouble logging on will know whom to call. Administrator Contact should be set to a method that people can use to get in touch with you, either a phone number, an extension, or an e-mail address. Once you are done, click on OK to finish. Now from the main screen, press the Application button, select the appropriate software package and click Edit to move to the application's Options dialog. This screen was purposely designed to look like the Options dialog for the selected application (Figure 3). Any changes you make to the program defaults in the application's Options screen, affects the configuration of the entire installation of the application for all user. To access the Group Information dialog (Figure 4), press the Group button. This screen lists all of the groups that currently exist. This Group Information option is a way to collect users together so that you, the administrator, can set user default options as a single unit. Where setting the Installation Options changed the defaults for every user, changing Group Options only affect members of that group. To create a group, click Add and the Add group dialog (Figure 5) appears. Enter a group (the internal name used by the software) and a name (the human-readable version of the same). For instance, you might want to create a group called "trust" that would be named "Trust Department." It is not necessary to create groups if all of the users of the program share the installation default values. Groups are simply a way to set or change defaults for multiple users quickly. Now, click on the Edit button from the Group Information dialog, and then the Edit button from the Edit Group dialog. The Options dialog, now labeled Group Options for group, should appear. From here, you can edit the default options for this particular group. Whenever you make a change to the setting, it will only affect the users belonging to this group. This way, different groups can have different data paths, for example, and be able to store their portfolios in different directories by default. Any changes made here automatically over-ride the installation-specific options you have set previously. 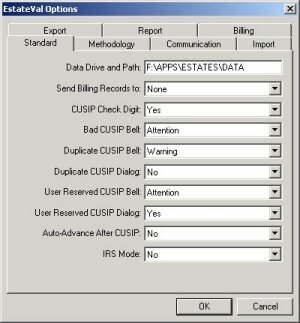 Finally, click the User button from the main EVP Administrator dialog to move to the User Information dialog (Figure 6). Click on the Add button to begin creating user accounts using the Add User dialog (Figure 7). From here, you can add users in much the same way you added groups. The "Login" is the user's internal name -- for example, "jdoe" -- while "Name" is his true name, or "John Doe." Group can be set to any of the groups that have been created, or [None] if this user does not belong to a group. Though the EVP Administrator currently allows you to specify a password for each user, you should not consider these logins secure. The passwords are stored as unencrypted plain-text and anyone can run the Administrator to edit them. EVP Office will gain true security in the future, but currently it does not have it. If you are interested in true security for EVP Office, please contact our Support Department at support@evpsys.com. Finally, you can change the default options of a specific user by clicking on Edit from the User Information dialog, then clicking on Edit again from the Edit User dialog. From the Options dialog that appears, now labeled User Options for user, you can edit the defaults for just this user. These changes will over-ride any installation-specific or group-specific changes you have made. This process can be repeated as many times as necessary, for as many users as you need to add. Billing records now show who ran each evaluation. Also when it comes time to upgrade EVP Office in the future, you will just need to install it once to F:\APPS\ESTATES, our place on the network.